Haris Papadopoulos contacted me through another blog of mine about two years ago with some questions about our dogs and the Brittany breed in general. He lives in Cyprus. 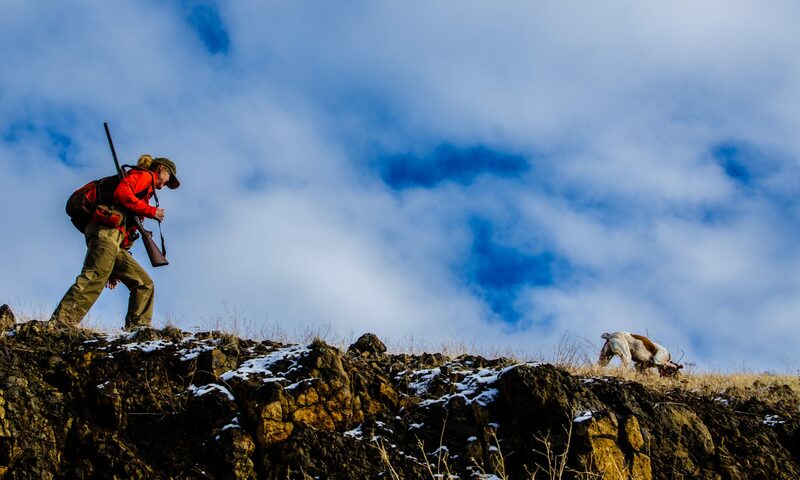 We’ve been in touch since then, and just a few days ago he sent a report on his chukar hunting season with some photos of his young Brittany, Molly, himself, and the terrain where he hunts. He agreed to let me share his information on this blog, and even agreed to let me interview him via email. I am very grateful to him for the time he took to write responses to my questions, especially since English isn’t his first language. I can’t say enough about how wonderful it is to connect with strangers like Haris through a shared passion for bird dogs, pursuing challenging game, and the indescribable effects it all has on us. Here are my questions and Haris’s responses, which I’ve only lightly edited. Enjoy. Please tell us about yourself: where you live, what you do for a living, where you grew up, and how you became interested in bird hunting. I live in Cyprus, an island in the Mediterranean Sea. My hometown is Famagusta but most of my life I have lived in Limassol. I used to travel a lot because I was a professional athlete (sailor), and for 9 years I was living in Athens so I could do my preparation and have easier access to central Europe for regattas. I studied sports management but due to the fact that we own a family transportation business, I decided to help my father keep the company. Our clients travel from all over the world to visit Cyprus for summer. So, as you might understand during holiday season, I am really busy. My family, grandpa, father, uncles, and cousins from the day I can remember, we were hunting together during chukar season. I even remember my first bird. Oh, that sound, when chukar leave the ground… All the magic is to see the chukar going up… Every time, after so many years, it feels the same! So, as a kid I could spend time with my father only when we were hunting, and actually now, as a grown-up, I feel blessed that I took these first steps with him. He taught me not only how to hunt but also the ethics behind hunting. Even though I still go hunting with my family, when we leave the car and take the dogs out, everybody hunts alone. This way the odds are in favor of the birds. Please talk about chukar hunting in Cyprus, what licensing and regulations are like there, if chukar hunting is popular, and what the terrain is like. First of all, in Cyprus there is no such thing as a private guide to offer hunting experiences or trips. Licenses are under public control. Every year they publish a map and you can check the areas you can go for hunting. To be allowed to get a license you have to be at least 18 years old and pass a written exam. You are allowed to hunt only with over-under or side-by-side shotguns which means only two shots. The quota for chukar is 4 birds per hunting day. You are allowed to start hunting as soon as the sun goes up and stop as soon as the sun goes down… Approximately (during chukar season) this means between 6:15 am until 4:50 pm. Before and after these hours your gun has to be packed and inside the car. Chukar season opens the first Sunday of November and ends last Sunday of December. We are only allowed on Wednesdays and Sundays, so approximately we get 17 hunting days with our dogs. I know it is not a lot but Cyprus is so small that if they allow more hunting days, the population of chukar, which is already decreasing, will completely disappear. But at least we can exercise our dogs from 15 July until end February, but I personally stop before chukar start to mate. Chukar hunting is very popular in Cyprus. Our population is 1.2 million, and last year we issued 44 thousand licenses. But hunting chukars needs strong legs, big lungs and good working dogs. Usually you can see hunters around the first 4-5 hunting days when it is easier to locate the birds. After that, especially on Wednesdays, I don’t see a single hunter up the mountain. The landscape is very similar to the one you are hunting. Rocky and low vegetation. Some Cypriot hunters prefer the woods, but I believe that is not chukar’s favorite. Through your videos I would say that the Hells Canyon landscape is very similar to the one I hunt. Do you hunt other types of birds in addition to chukar (I noticed a woodcock in one of your photos)? My heart beats only for chukar. BUT… There is a very big but here. Unfortunately, as I mentioned before, the chukar population on Cyprus is decreasing. Also, I believe the quota per hunting day of 4 birds is too high. So, even though I could spend all hunting season chasing chukars, I don’t. Some of my hunting days I spend on woodcocks. I do like woodcock hunting, different landscape, different conditions but if I had to choose, I could hunt chukars for the rest of my life. Please describe your relationship with bird dogs; did you grow up having bird dogs? It’s not just a relationship. I can’t really find the words to say it. Dogs were always part of my family. At the beginning of this interview I mentioned that from the first day I remember, I was hunting. Same for bird dogs. My father always hunted with English pointers. He really loved them. I found some books, when the Internet was not even a thought, that showed he was ordering his dogs from British breeders. Our first pointer came to Cyprus 1978, before I was even born. So, as a kid we always had a dog around. Please describe your interest in the Brittany breed. Please describe how you trained Molly, what was challenging about training her, and how often you and she hunt together. First thing, we learned the basics: sit and stay, ok, and give hand because I liked it. She was a bit nervous on wait, but I thought, she is still a pup, she will learn. Molly is almost 2, so I had my first full season with her this year. Last year, when she was a pup, I was taking her with me for hunting or exercise to become familiar with the field, get the smells, and overcome any fears she might have. Oh, god! The first year I thought I’d made a terrible mistake. She was so nervous, so anxious and I thought that I got a flushing dog instead of a pointing dog. I read so many books and thought I tried everything. I remember one day I planted a quail and I had her on leash. As soon as she got the smell she was trying so hard to flush it that she was crying… That day I said, Ok, I have to email Bob again for some advice. Indeed, he was right: she was just young and passionate. We finished the first season without a single point. We went back to the training field all January until mid-February… We were sleeping together, eating together, watching movies together, and sharing the same passion together. But we were missing that point. I will never forget 12 February 2018. 6:53 am. First point on chukar! I got on my knees, took her in my arms and started crying. Before my eyes, my baby girl was growing up. From that day everything changed. We started our training sessions mid-July for this season. Was very hot, but we didn’t stay out for long. Maximum 1 hour because with more than 30 degrees Celsius [86 Fahrenheit], she was not able to stay for more. A hunting day can last 8 hours if we don’t hit the quota early in the morning, so she has to be well prepared for this. One hour during summer could easily be 4 hours during winter. This season, Molly still hunted with so much passion, but through experience she is learning how to turn passion into smart hunting. Point after point, she understood that in order to shoot a bird she needs to point. She needs to show me the way. Without her I cannot track, and without me she can’t get. Please describe the best hunting day you have had with Molly, and what made it special. Hot and light wind day. Half way you can find 5 pine trees on one side of the cliff (not very steep), where there is good shade to get some rest. We started walking around 6:30 am and we didn’t see a single chukar, and by then it was already 11:00. So, as I was resting, Molly went on the back side of the cliff to get some water from a stream coming down. After 2-3 minutes I heard the beeper on my Alpha, and I could see her on point. I said, No way! I jumped up, put on all my gear again and started to run. Indeed, not only Molly was on point but she blocked her first chukar! Pointing and blocking are different. In Cyprus, it is very rare for a chukar to be blocked so that the hunter will be able to get within a distance of 2-3 meters and then flush the birds himself. Her nose was so close, her eyes were so big. All her body was shaking. We were so happy to get that one and I was so proud of her. My Molly, my gun dog, my princess! I don’t often think about hunting outside of the U.S. Thanks for reminding me. This was fun to read. Glad you liked this, Greg. Thanks for reading. I find this interesting that bird hunters throughout the world share such similar emotions hunting chukar. We are privileged to have so many days to hunt here in America, with such ample bird numbers. I have family living in hawaii, and plan to go hunt chukar there. Among other various upland species. It appears you can hunt 2 days a week in there season, but bird numbers are high on the big Island. Isn’t that cool, Gabe? What a great cultural bridge. And yes, we’re so lucky we can hunt as often as we do. I’d love to see what chukar hunting on Hawaii looks like. Make sure you take a bunch of photos! Thanks, Chris. I’m trying to persuade Haris to take a trip out here sometime before too long. Great interview—makes me want to travel there. You are more than welcome! If you ever travel to Cyprus please let me know and if its hunting or training period we can go together! Dear Bob, thank you for giving me the opportunity to share my stories with Chukar community. It was an honor. We all share the same passion. I don’t know if i will be able to hunt in the US because i never left Molly behind but i will do my best to find a way. Have a great day to all! great article. It would be excellent to get him out here. Nice to hear how much he loves his brit. I can relate. You need to write a book. We don’t need another how-to book on chukar hunting. We need your wisdom on the people and dogs that you have welcomed into your home, hills and canyons of Idaho. Maybe we need to hear your thoughts on the sacredness of the hills and the birds that you know so well. Maybe there’s a chapter on why you do what you do and why you’ve discovered your passion. ONLY YOU know what to write about. You’re a great writer. Use your fancy education, your facility with the English language, your love of teaching and your love of those crazy birds and write a book. We need you to write a book. Mark, I’m working on it. Slowly. Your kind, inspiring words mean more than you know. Thanks. Great perspective from Haris! Nice to read something completely different than the norm Bob. Thanks. What passion! Reading this story makes me feel somewhat normal! I can really relate to Haris working with his dog as my pup is finishing up her first season.